Having an integrated sales and marketing department is key to having a well-oiled sales funnel. This is because the work that marketing does, like creating content and campaigns, has a direct impact on the number of the leads, and the quality of these leads, that end up in sales' hands. This is what is known as the integrated sales cycle. 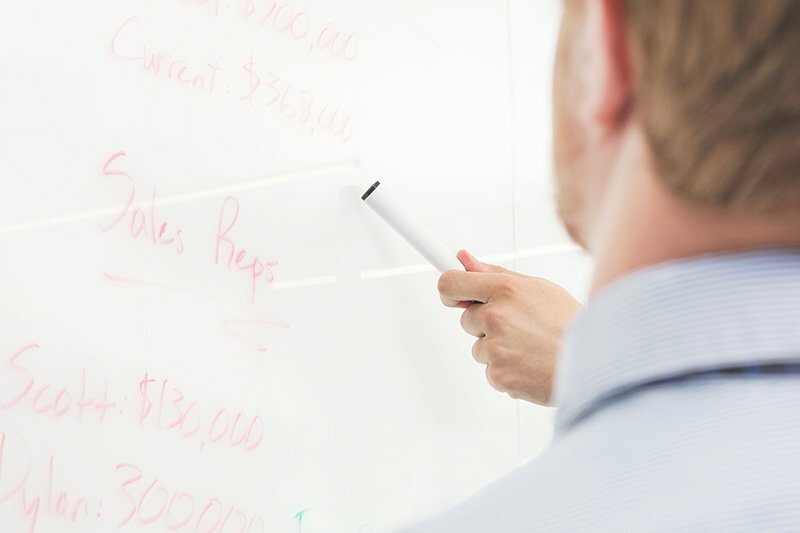 The goal of integrated selling and marketing is ensuring sales and marketing work closely together to ensure that the goals of both departments are aligned. In this post, we are going to talk about six easy ways you can integrate your sales and marketing team to close more sales and also achieve a better ROI on marketing campaigns. Your sales and marketing teams should meet frequently to communicate ideas, voice worries or ask questions about how marketing and sales are working together. Marketing should ask the sales team questions that will aid them in creating better marketing campaigns. This could be questions about buyer behaviour and what are people’s reasons for not buying at the moment. Marketing can then address these concerns in their marketing material. Sales and marketing also need to agree on what is expected from each other. For example, sales may want marketing to work on bringing high-quality leads and marketing may expect the sales team to follow up on leads promptly and provide a good sales service, which may encourage recommendations and more leads in the top of the funnel. We just mentioned the importance of high-quality leads; this is a subjective term that could be understood differently by the two departments. Therefore, sales and marketing need to work together to create some kind of framework for what constitutes a valuable lead. This could be by working together to create a persona, or simply just deciding who you are trying to target in marketing campaigns. To create a truly integrated sales and marketing operation, the message projected by both departments needs to be consistent. If the sales team put emphasis on the price of the product, then the marketing team should also highlight this in their marketing campaigns or material. Another good idea is to have your sales team review marketing materials to make sure both departments are clear on the message and promises being made. A great way to harmonise sales and marketing data is by showing it together on the same dashboard. 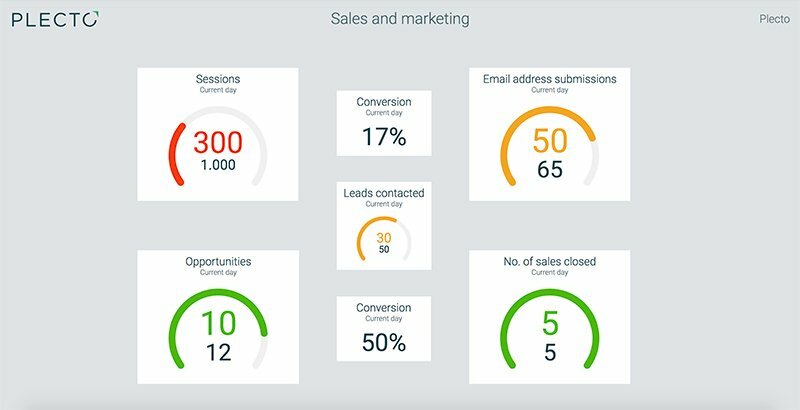 On such a dashboard, you would combine the most important sales and marketing KPIs. One way to visualise these KPIs could be in the layout of a sales funnel, showing the percentage of people that drop off between stages of the funnel. This helps to identify whether you’re having conversion problems at the marketing or the sales stage of the funnel. Both departments being able to see the same figures at the same time ensures everyone is fully informed and responses can be coordinated. How can Plecto do this? Plecto is the perfect tool for creating a sales and marketing dashboard with your important KPIs. You can display these dashboards on TV screens in the area where the sales and marketing teams sit so they are constantly visible to both. Of course, here at Plecto, we use our dashboards to effectively integrate our sales and marketing teams. Our marketing team is mostly focused on obtaining as many leads as possible, as one of their most important KPIs is how many leads they manage to generate. Our sales team is naturally more focused on getting promising leads that they can turn into opportunities, and eventually a sale. Recently, we had a situation where we were getting a large number of leads into our funnel, but the sales team were unable to get into contact with these leads and an extremely small amount turned into opportunities. Our sales managers were able to quickly identify the source of these leads by looking at their shared marketing and sales dashboards and the problem was rectified swiftly. Getting sales and marketing to work together can sometimes be tricky, due to the different goals of both departments. One way to encourage greater cooperation is by incentivising your sales and marketing KPIs. One easy and effective way to do this is through gamification. Gamification tactics like rewarding employees for hitting targets can help increase engagement in their tasks, which is great when looking to effectively integrate sales and marketing and get employees on board. Switching departments for a day is definitely something that isn’t feasible for all businesses, but it can be really valuable. It can also help to scratch the restless itch that many employees suffer from when they crave change in their job; a Gallup survey from 2016 found that development or progression was something that 87% of millennials wanted from their jobs. Spending time in the sales team as a marketer or vice versa, helps you to understand the daily challenges that the department faces and helps spark ideas on ways to fix this back in your own department. If there is tension between your sales and marketing departments, then this is also a good way to improve relations. Although this may seem like a drastic measure, it has proven successes. In the office of Spreadshirt, Global Customer Service Director Marie-Luise Wendt spent 18 months working in the company’s HR department. Here she got a deep understanding of employee engagement and leadership before moving back to her original post in customer service. She was soon promoted to director of the department thanks to all the knowledge she had gained. Start a 14-day free trial of Plecto and see how dashboards can help integrate your sales and marketing teams.